At Tree Works, we use the best available machinery to complete all of our jobs safely, efficiently and expeditiously. This means making the most out of our time. All of those efforts have been enhanced with the use of our chipper and bucket service. Our bucket truck is capable of extended to elevated heights and work on parts of trees that may be otherwise hard to reach. This option allows our team to safely reach heights and perform tree service that would not be able to be done without this kind of equipment. 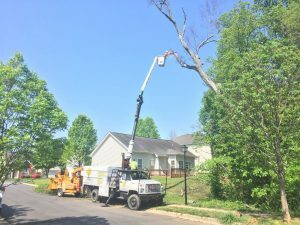 Not all of our tree trimming services require the use of our bucket truck, although it is an excellent option to have and helps immensely in certain situations. Our bucket trucks also feature equipment that is new and well maintained. We feel as though our presentation means a lot and that is why we are committed to keeping our bucket trucks in the best possible condition. Every component is serviced regularly to ensure proper functionality when we provide service. If you are looking for tree service with the assistance of a bucket truck, Tree Works has a solution for you. Our state of the art wood chipper can quickly grind up tree limbs, branches, shrubs, sticks and other forms of yard waste. At Tree Works, our chipper service is available for those who have fallen branches in their yard or to a large collection of sticks and wood in their backyard. A chipper is also great when cleaning out an area of your yard or doing some outside renovations. The benefits of using our chipper service is that you do not have to pay for the labor when it comes to yardwork. Simply put together piles of the brush and we can come by with our wood chipper and let the equipment do what it does best. Long, thinner pieces are recommended as this requires less time and effort. The best part about our chipper service is that you will not have to haul anything away. Just sit back and allow the team at Tree Works do the hauling. After completing any kind of yardwork, you deserve the chance to relax while someone else attends to the final stages of the job. Tree Works is ready to extend that courtesy to you as part of our chipper and bucket service in Charlotte, NC.